Do you like eating in an empty restaurant? 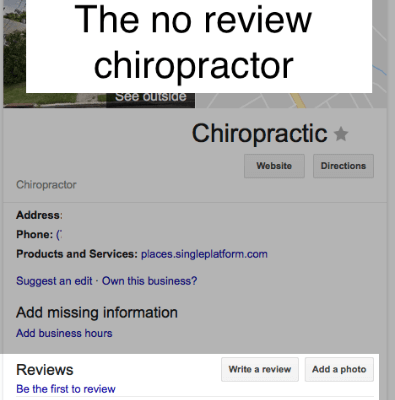 Well no one likes going to a health-care practitioner that has no Social Proof! For small businesses, online reviews bring the benefit of social proof to the table—they help increase (or decrease) the degree of trust felt for an unfamiliar business based on feedback from other people with similar needs. In fact, a 2014 study found out that 88% of consumers now trust online reviews as much as personal recommendations. The same study also found that the more reviews the business has, the more trustworthy it is deemed; and most consumers read up to six reviews to make up their mind about the business. Google reviews can often be the crucial tiebreaker between which office people choose. Patient reviews are among the first things people see when they search for a health-care provider on Google or Google Maps. Moreover, it’s been shown that positive reviews provide a greater boost to conversion rates than any other local SEO effort. Make a point of telling your patients that their review is important to your business to help you make their experience better but also to help other people that also need to improve their health to make a decision on who to trust with that huge responsibility. 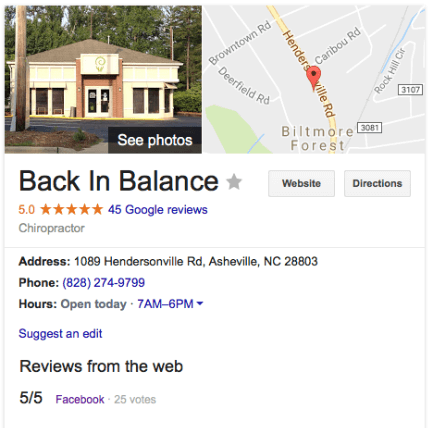 A practice like Back In Balance has Social Proof and as a result when patients are looking for a doctor in Asheville thats who they go see.